Do you want to score Rose Bowl tickets at a reasonable price? VIPtix.com makes buying tickets at the Rose Bowl easy and affordable! Find out what's happening in the 'Pasadena' area below. Click on any Rose Bowl sports, concerts or theatre event you're interested in and simply reference the seat locations on the Rose Bowl seating chart. Pasadena is a unique and special place and seeing a live event at the Rose Bowl is an experience you won't soon forget. Buy your 'Rose Bowl­ Pasadena' tickets today! VIPTix.com is a safe place to buy Rose Bowl tickets. We've been in the buying and selling sports, concerts and theater tickets business since 1989. VIPTix.com's main business is VIP tickets! In fact, VIPTix.com handles Rose Bowl VIP tickets worldwide so we can offer cheap Rose Bowl tickets. There are times our Rose Bowl events tickets are less expensive than the individual face prices offered at the box office! VIPTix.com's Rose Bowl ticket connections allow us access to all kinds of concert packages, including Rose Bowl Meet & Greet passes and VIP backstage experiences! Check out the Rose Bowl Events Schedule. See our interactive Rose Bowl seating charts so you can quickly find VIP Floor tickets, Lower, Club or Upper Level seats by the stage at affordable prices. The Rose Bowl ticket price you see, is the price you'll pay! No surprises at VIP Tix! Most all Rose Bowl tickets are shipped via FedEx or emailed to you as e­tickets. The majority of our Rose Bowl tickets orders are processed and shipped within 24 hours of your order. VIPTix.com can even guarantee Rose Bowl will call pick-up for all last minute orders. All VIP Meet 'N Greet tickets will be handled by representatives on­site. If your Rose Bowl tickets have not been printed or distributed by the Rose Bowl Box Office at the time of your order, they will be shipped as soon as they are received by VIPTix.com. You have finally found a VIP Rose Bowl tickets source that provides good seats at cheap prices! It's so easy: VIPTix.com provides a safe marketplace so you can buy and sell Rose Bowl tickets with 100% confidence. Buy Tickets -­ VIPTix.com stands behind our Rose Bowl ticket purchases with our 100% VIP FanSafe Guarantee! You'll get the tickets you ordered in time for the event and they'll be valid for entry. If any of the above does not occur, we'll locate comparable replacement tickets or send you a refund. Fast confirmations and prompt, professional Rose Bowl ticket delivery always in time for the event. 100efund for any Rose Bowl concert canceled and not rescheduled. Our clients are luxury sellers that list their VIP Rose Bowl concert tickets with VIPTix.com. Sell Tickets -­ It's free to list your Rose Bowl tickets. With our technology, VIPTix.com can list your Rose Bowl tickets on so many different ticket websites just like we list our own Rose Bowl VIP Tickets. 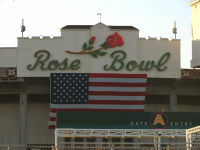 You have the choice to manage your own Rose Bowl tickets prices or let the experts at VIPTix.com manage them for you. VIPTix.com will pay you promptly for all Rose Bowl tickets orders that you confirm and fulfill. Make more money as our clients are luxury buyers that are looking to buy VIP Rose Bowl tickets. VIPTix.com is not affiliated with Rose Bowl or the Rose Bowl Ticketmaster box office. VIPTix is a marketplace that buys and sells Rose Bowl tickets, and our prices are at market value which may be above or below Rose Bowl face value tickets. Any use of trademarked artist or venue names on this site are used expressly for descriptive purposes. Click here to join our email list for the latest offers on all Rose Bowl ticket, Rose Bowl packages and VIP Rose Bowl Meet & Greet passes.